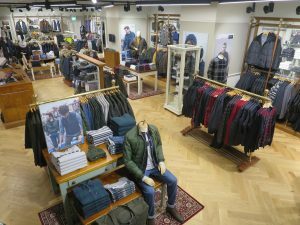 Owned and operated by Barbour’s key UK partner, Outdoor and Country Retail Ltd, the 1,700 sq ft store located next to T.M. Lewin stocks Barbour’s Classic Countrywear, Coastal, Nautical and Tartan Collections, alongside footwear, accessories and popular products for dogs. Designed by WYJ Ltd in collaboration with Barbour, the store will be Outdoor and Country’s fifth Barbour branded retail store in the UK and will offer free click and collect and free returns to store. The opening follows the recent news that Morphe Cosmetics, the US make-up brand, is to open its first store outside of London and second in the UK at the Bullring. Alongside this, Christian Louboutin and Gucci have both opened new boutiques at Selfridges Birmingham in Bullring, as part of the continued investment in this famous department store.